I have been working on this for a little while now and its finally coming around. The reason for it is to have the correct case length in order to use longer bullets and still be able to fit them inside a mag. The old standards ( 6mm-223, 6x45, 6TCU etc. ) 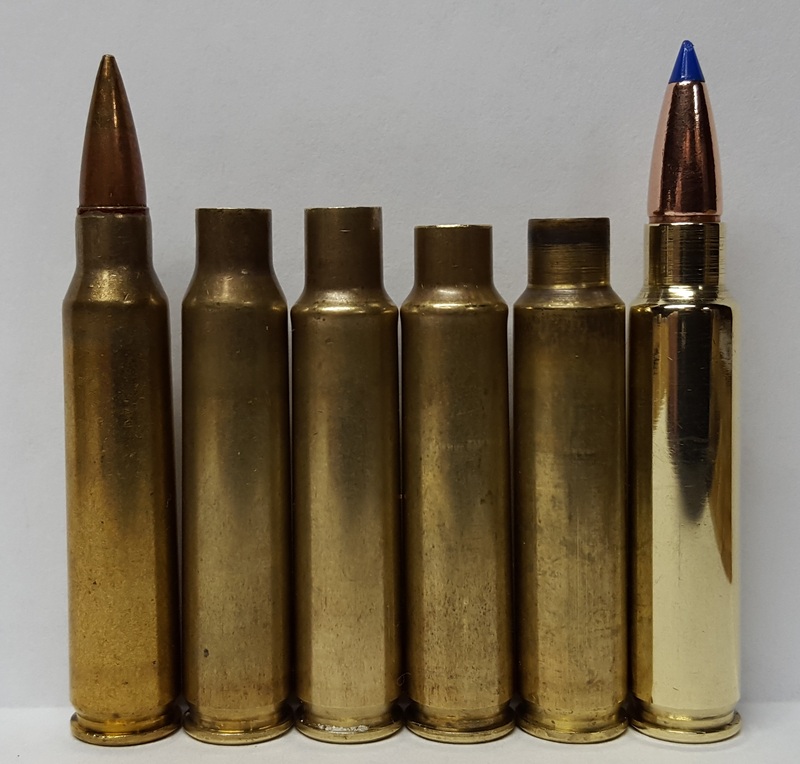 all have difficulty when trying to use non varmint bullets at mag length because of the nose length. I chose to use a 40 degree shoulder in order to keep the neck length close to caliber size for all of the reasons longer length necks are good. The steep shoulder also allows the body of the case to be longer relative to 23 degree and 30 degree shoulder angles. This along with the decreased body taper allow the case to have nearly the same useful capacity as the 6-223 case despite it being .050" shorter. Since the case has the same body taper and shoulder angle as the 6TCU, I use a modified 6TCU die for forming and resize. I'm not good at writing, so here is some pictures and data. I have a boat load of 105AMAX, so I used them on the first loads shot from the barrel. Here are the results from the last strings I shot. This was on new brass that was not completely formed. Cant shoot these from a closed front mag. I like it!! I built a 6x45 back in 1983 or so; it really wasn't as good as I hoped. Need to use light bullets to fit mag, which somewhat defeated the purpose. THIS looks interesting! Looks sweet Jw great velocity and accuracy can't ask for more. Shot this today. 107 Nosler CC's Mowed the range this morning. Distance was 100yds. ...and 28 grains wins. We are going to have a lot of fun with this. What do you think the best "varmint" bullet will be? No idea, I got some lighter bullets ordered but they have not come in yet. I might be wrong, but I don't think they will shoot any better than the heavy weights. Still have about a grain or two of capacity left with fire formed cases. This thing will be a killer on the 600 line. New brass seated .005" into lands for fire forming. 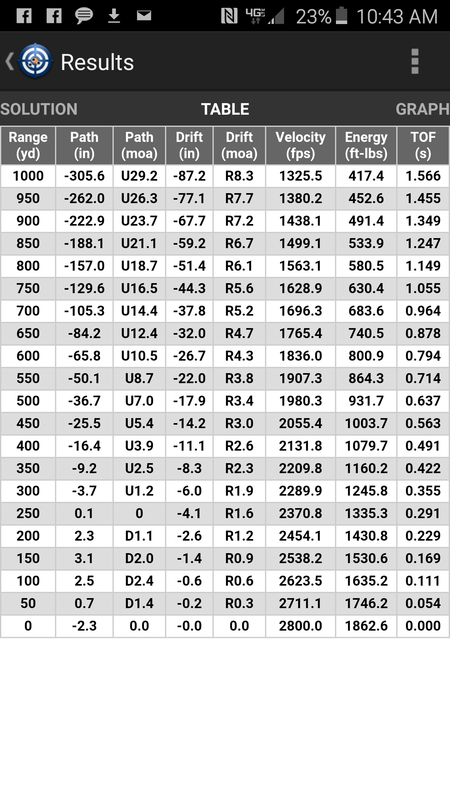 No accuracy data due to rain. changed to fireformed case, and load length to 2.275" .040" off lands. will fit in a mag at this length. Ran out of light before string was done. Very impressive! Too bad I can't rechamber my old 6x45. What are you going to call this new 'cat? "6mm Turtle Thumper"? "6mm Tharpe"? Not bad numbers JW. In my 22inch 6mmARP barrel with a 90grAB set to 2.295 with VV N530 I can run about 2950 in Hornady brass. At 3000fps I blow primers. I need to try the same load with Lapua brass. Coondog, that was Lake City brass. I'm liking it better than the lapua. The necks are thinner where they meet the shoulder after forming and don't have to be turned. 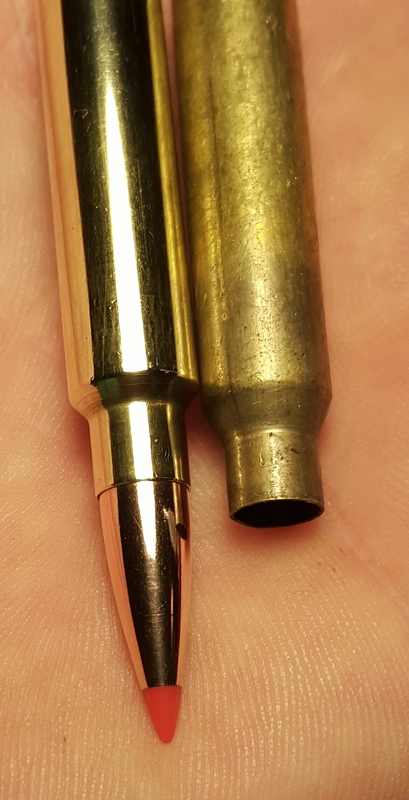 I was going to turn some after turning lapua brass and the turning tool went all the way to the shoulder without cutting anything. Lapua has to be turned, it makes a step where the shoulder gets pulled up into the neck. The shoulder is much thicker on lapua brass. One of the loads that worked good for me was with 60gr SMK and LT-32 powder. I tried to get to 3300fps but never made it. In the Grendel/Lapua case necked down I still had plenty of room for more powder but the pressure went to high. Lt-32 acts a lot different in the small boars. I'm going to try some LT-32 with some 70SMK's next time out. LOL I bet it was the 70gr SMK I used. 60gr just did not sound right. One thing I like about your 6mm is the case size. Seems once a case gets bigger than a 6.8 case, you run into cycling issues. Running as long as you can with the bigger cases really helps. That's a pic of the last 8 rounds shot today. 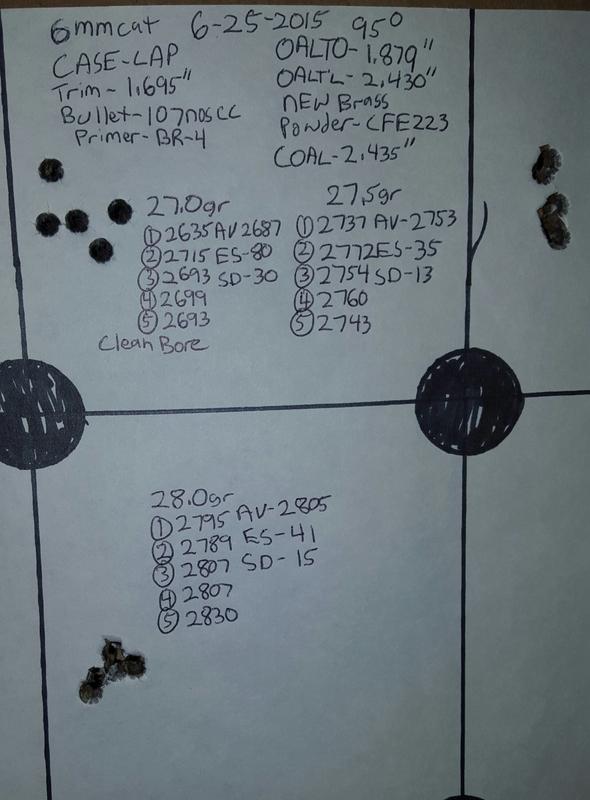 The three on the left was 30.5gr load, and the five on the right were 29.0gr. with fireform case mag length. You can see some slight craters but other than that, they look good. Brass not bulged out close to the head, no flow into the ejector/extractor. Most military 855 cases look worse than this from most of my 5.56's. One of the reasons I started on this is the brass. 5.56 brass is everywhere. I have seen 6.8 brass and 6.5g brass become hard to find. Also both of those are expensive compared to surplus Lake City brass. They should run real well in metal mags. Magpuls will probably need to have the inside rib shaved down a bit to prevent tilting. The steel mags from CPD, and ASC will give the longest load lengths. Im going to cut the fronts out of a couple for those rounds that I want to run out past mag restricted length. RJ, we would have to set your old barrel back around .080" to make it work. Then your gas tube would be too deep into the carrier key. I have not come up with a name. All of the good ones have been taken. Lol. My 22" 6x45 barrel was custom made by SGW/Olympic Arms back about '82 or '83. 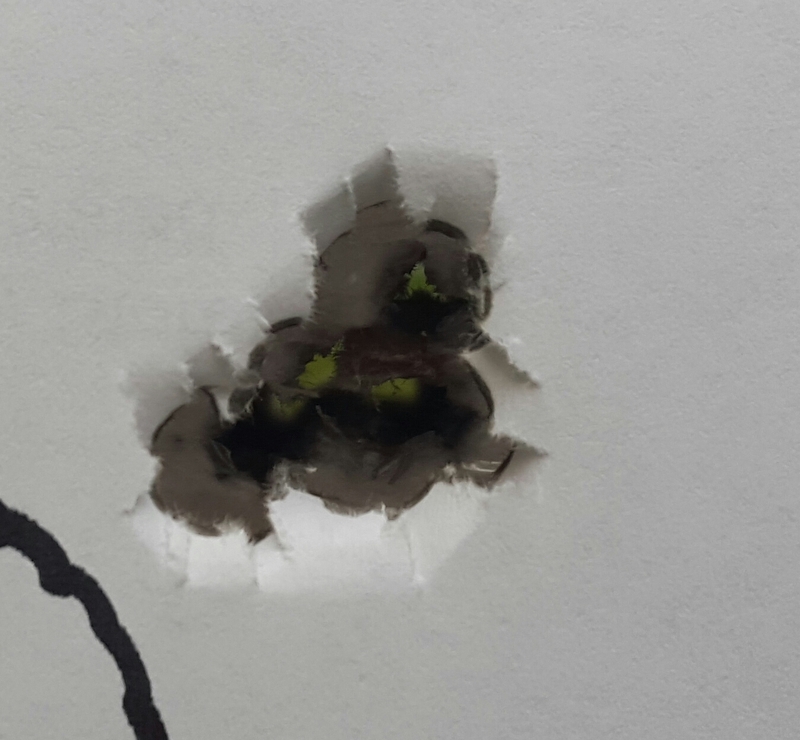 GREAT accuracy with light bullets (55-70gr). This was long before the craze for heavy bullets in 5.56... so a 60~70gr bullet from an AR was considered "heavy". I bought a bunch (~1k) of 90gr FMJ-BTs to try, but they proved too long. I don't recall the twist - but I'd guess 1:12 or 1:11. Guess I'll keep it as a "safe queen" experiment. Going to turn the gas on this weekend hopefully. It might not cycle/feed. If it dont, then I will have a good safe queen. 1st shoot up some 223's and save the brass. 2nd case, clean up and deprime your 223 brass. 3rd case, resize the clean 223 case. 4th case, trim resized case to 1.690", add primer, powder and bullet of choice, and shoot making sure that load has enough pressure to push out the shoulder and walls. 5th case, you now have properly formed cases for maximum effort loads, resize and trim to 1.690" max. 6th case, load your favorite 6mm projectile and powder. This one is a 80TTSX @ 2.285" it is .035" off the lands. The case mouth is in the middle of the crimp groove, you have +/- .020" to play with either way to tune load and keep mouth in the groove. I think I'm in love... again. When is JBFA going to offer prepped and RTL brass? Looking good JW. I see the birth of a new cat here. JW wanted it to be associated with MDWS in some way originally. I wanted to name it the 6mmJW but he wouldn't have it. So, 6-MDWS it is. Or some variation thereof.